Background:Healthcare decision makers face challenges in using guidelines as effective evidence-based tools for coverage decisions. 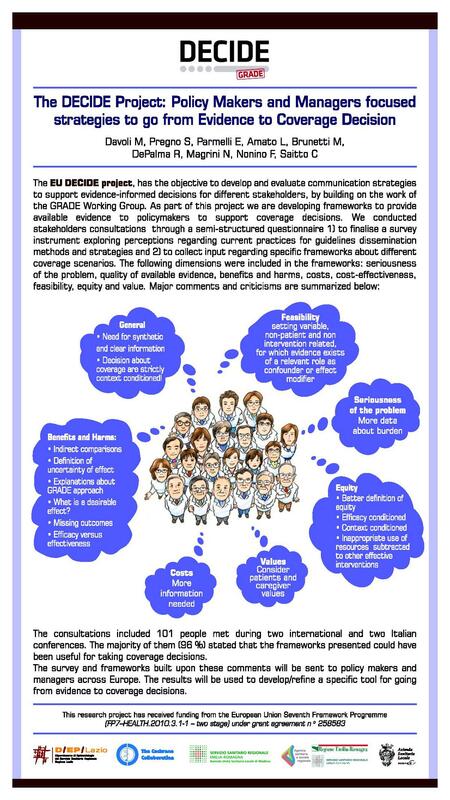 The DECIDE project, funded by the EU 7th Framework Programme has the objective to develop and evaluate communication strategies to support evidence-informed decisions for different stakeholders, by building on the work of the GRADE Working Group and the Cochrane Applicability and Recommendations Methods Group. As part of this project we are developing specific tools to assist policymakers in coverage decisions. Objectives: To conduct a survey among policy makers aimed at exploring their perceptions regarding current practices for guidelines dissemination methods and strategies, obtaining input regarding specific tools for going from evidence to coverage decisions. Methods: The survey sampling includes policymakers, managers and their staff, in charge of coverage decisions in each of the 8 countries involved in the DECIDE project. By “coverage decisions” we mean “decisions by third party payers - public or private health insurers - about whether and how much to pay for drugs, tests, devices or services and under what conditions”. Based on different coverage scenarios (on therapeutics and diagnostics), the following dimensions will be explored: seriousness of the problem, quality of available evidence, potential benefits and harms, costs, cost-effectiveness, feasibility and equity. Participants will be contacted by email and will answer an online form. Results: Our primary analysis will focus on feedback for the finalisation of the tools that we are developing. No statistical analyses are planned. However, in secondary analyses we will explore potential differences in responses across participants from different countries and across groups with different types of experience. Conclusions:Feedback from the target audience will inform the development of the tailored evidence-based tools for coverage decisions.